As a dietary supplement, take two 500mg capsules of White Jelly Mushroom Extract once daily. What are Tremella fuciformis Mushroom Capsules? 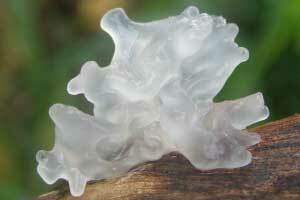 Tremella fuciformis, known as White Jelly or Snow Fungus, is a tropical mushroom found on hard woods after heavy rains. This mushroom is one of the most popular fungi in the cuisine and medicine of China. Tremella fuciformis is a white, nearly translucent, fungus throughout Asia and in warmer climates worldwide. The fungus gets the common name of silver ear for the way it looks on the decaying logs on which it grows. Tremella fuciformis may support immune health. According to Chinese traditional medicine, if it is eaten regularly, facial freckles may lighten or disappear. However, this has not been scientifically studied. Nootropics Depot has partnered with Nammex to offer these certified Organic whole fruiting body extracts, with not only testing to verify the percentage of active beta glucans, but verification that starch content is low, and that there are no pesticide residues. One of the biggest controversies in the mushroom industry today is the use of mycelium on grain extracts. Mycelium is to a mushroom like what roots are to a tree. When grown properly, they will form whole fruiting bodies; which are called mushrooms. However, to save money, most US producers of mushroom extracts today grow the mycelium on a bed of grain, like rice. To speed up production, and to make the end product cheaper to produce, these manufacturers grind up the mycelium and grain together, before allowing them to form whole fruiting bodies. The issue with that is that mycelium is not a mushroom, just like the roots of a tree are not a tree. The beneficial compounds in these mushroom species are all studied with relation to their fruiting bodies. The FDA even states that mycelium is not allowed to be called "mushrooms." However, many of the biggest brands today thwart that FDA guideline, and put out a cheaply-made, mislabeled, and ultimately inneffective products. They hide this fact by standardizing to "polysaccharides" instead of "β-Glucans." Well guess what shows up as polysaccharides in the traditional testing? Carbohydrates! Yes, the very carbohydrates from the rice used to grow the mycelium is used as a measure of the active ingredient in these substandard extracts. When you are buying one of the major mushroom extracts on store shelves today, you are buying a bunch of ground up rice mixed in with mycelium! It's a scam! This is why we decided to partner with Nammex. We are selling only certified Organic whole fruiting body extracts, which have been tested for not only the active β-Glucans, but to ensure the starch content is low; to prove what you are getting is actual mushroom, not ground up rice. You will know right away how big of a difference it is. You can even go to the store right now, and pick out one of the major mushroom brands. Mix the "mushroom" powder into some water, and ad a drop of iodine. It will quickly turn a dark purple/blue, indicating high amounts of starch. You'll immediately see how big of a scam it is, and just how many "trusted" brands are in on it! Nootropics Depot offers 60 count or 180 count jars of certified organic White Jelly Whole Fruiting Body Mushroom Extract Capsules (Tremella fuciformis). Nootropics Depot's White Jelly mushroom Extract (Tremella fuciformis) has been lab-tested and verified for both product purity and identity. To learn more, read the Tremella fuciformis mushroom extract reviews and experiences below.